From the classic commercials featuring Michael Jackson and Ray Charles, to the long-standing rivalry with Coca Cola, the 120-year-old beverage has become an iconic part of global pop culture and shows no signs of stopping. Here are 11 things that you may not know about the drink that has been hitting the spot for generations of soda drinkers. 1. 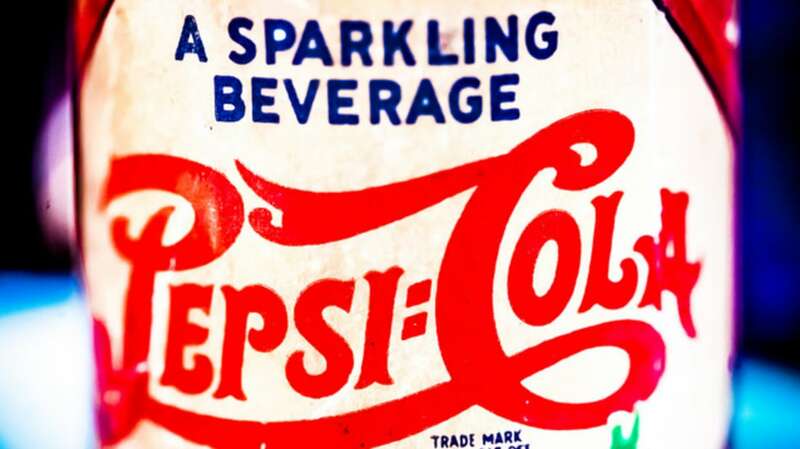 PEPSI-COLA WAS ONCE CALLED "BRAD'S DRINK." The inventor of Pepsi-Cola was a druggist in North Carolina named Caleb Davis Bradham. In 1893, Bradham began selling “Brad’s Drink” at the soda fountain in his store. The beverage was a mixture of sugar, water, caramel, lemon oil, nutmeg, kola nuts, and a few other ingredients. Five years later, Bradham renamed the drink Pepsi Cola because he believed that it helped to stave off dyspepsia (indigestion). 2. WORLD WAR I COULD HAVE BEEN THE END OF THE COMPANY. The price of sugar increased significantly during the war, and Bradham used the opportunity to buy more of it, thinking that the price would continue to climb and he would be able to sell for a profit. The gamble didn’t work out in his favor, and in 1923 Bradham declared bankruptcy. The company was purchased eight years later by the Loft Candy Company. 3. PEPSI STAYED AFLOAT BY OFFERING MORE COLA FOR LESS MONEY. While competitors were selling 6-ounce bottles for a nickel during the Great Depression, Pepsi began selling 12-ounce bottles for the same price. Their profits doubled. They even had a catchy jingle to make sure that consumers never forgot that their price was right. 4. THE BRAND GAVE SOFIA VERGARA HER FIRST ACTING JOB. The Modern Family star was only 17 when she starred in her first commercial. The 30-second Pepsi ad ran in South America and featured Vergara in a bikini trying to get across the hot sand to a Pepsi cart. Vergara said that the commercial made her famous and that it was one of the reasons why the company approached her to be a spokesperson for Diet Pepsi in 2011. 5. PEPSI WAS THE FIRST SOFT DRINK COMPANY TO USE TWO-LITER BOTTLES. In the 1970s, an inventor named Nathaniel Wyeth developed a bottle made of polyethylene terephthalate, which was lighter than glass, wouldn’t shatter if dropped, and wouldn’t contaminate its contents. By 1976, Pepsi was selling the bigger bottles to thirsty consumers everywhere. 6. THERE WERE PEPSI MASCOTS IN JAPAN. In the 1990s, Pepsi Japan approached Canadian comic book artist Travis Charest to create a character to be used in their television commercials. Charest came up with a faceless superhero named Pepsiman, who ran around bringing the beverage to anyone in need. Pepsiwoman made her debut in a later commercial for Diet Pepsi Twist, and there was even a 1999 video game that involved guiding Pepsiman through obstacles so that he could deliver the carbonated drink to fans. 7. THERE ARE DOZENS OF VARIATIONS YOU'VE PROBABLY NEVER HEARD OF. Like most global brands, Pepsi has experimented with different formulas in different markets around the world, and has also sold limited edition flavors during holidays and other special events. In Japan, Pepsi flavors have included azuki bean, strawberry milk, shiso, cucumber, baobao tree fruit, yogurt, and salty watermelon. 8. PEPSI WAS THE FIRST PRODUCT TO BE ADVERTISED USING SKYWRITING. In 1932, Pepsi hired pilot Andy Stinis to write their name over various cities in the United States, running accompanying print ads in local papers to let consumers know that the Pepsi-Cola Skypilot was coming to town. Over the next decade, there were around 14 contracted skywriters working for Pepsi, and in 1940 they wrote approximately 2,225 messages over the United States, Mexico, Canada, Cuba, and South America. 9. THE COMPANY HAS NEARLY 500 PATENTS, INCLUDING ONE FOR A TENNIS RACKET. In the mid-1970s, PepsiCo patented a tennis racket that was invented by Douglas E. Dempsey and Gerald F. Herndon. The racket substituted wood and nylon for a “synthetic resinous material which may be integrally reinforced with high modulus reinforcing fibers." The frame is described as consisting of two interlocking channel-shaped pieces with aligning holes for the strings. 10. PEPSI-COLA WAS THE FIRST AMERICAN PRODUCT TO BE MANUFACTURED, MARKETED, AND SOLD IN THE SOVIET UNION. At the 1959 trade exhibition in Moscow, Richard Nixon (who was friends with a Pepsi executive) convinced the leader of the Soviet Union, Nikita Khrushchev, to taste the product. Khrushchev and Pepsi formed a relationship, and in 1972 a deal was signed to get the drinks on store shelves in the U.S.S.R.
11. THERE HAVE BEEN 11 PEPSI LOGOS OVER THE PAST 122 YEARS. The iconic globe symbol that the brand uses today did not exist until the 1950s when the stylized script logo was applied to a graphic of a round bottle cap with red, white, and blue swirls. In the early 1960s, the word “cola” disappeared completely, and the script was replaced with bold text. Each version of the logo since has used the globe symbol, the most recent being a $1 million update by the Arnell Group, which came with its own 27-page design brief.